"You never know when you will suddenly be confronted by a 'do or die' situation. None of us can. Jason’s unique collection of such incidents are recounted by real CIA covert operations officers. And intriguing and fascinating as they are, their greatest value is in giving you insight into the way of thinking and reacting that these covert operators demonstrate. Just one story could save your life." "In the past fifty years, I have conducted leadership development workshops for over 100,000 leaders in Russia, Europe, the United States, Mexico, Canada, and Australia. I can confirm that whether you travel around the world or just in the United States, this is a must-have book for surviving in today’s world. Every American can benefit from this book and it should be mandatory reading for staying safe." 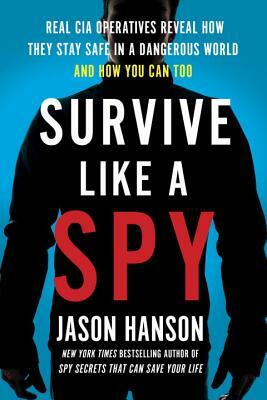 "Survive Like a Spy is both a thrilling read and a primer full of lifesaving tactics. It’s a rare chance you get to learn from the best CIA operatives on how to stay alive in the crazy world we live in, which is why I highly recommend this book." "As someone who’s worked operations with the CIA, I can tell you that Jason and his team are the real deal and that you’ll absolutely learn many life-saving skills in this book. In fact, I can’t believe the CIA let Jason share some of these stories." "I attest to the life-saving techniques presented in this book. I have relied on the tradecraft skills disclosed in this book to keep me alive and out of foreign prisons. I have conducted operations with the operatives who have shared their stories in this book, and as amazing as it sounds, this book presents factual and accurate methods used by intelligence operatives." "Survive Like a Spy is an incredible survival book. Even though I’m a Marine, retired police officer, and black belt, I learned spy survival tricks that I can add to my arsenal." "Great tips on staying safe from a former CIA officer. This book is a good addition to the library of anyone who wants to keep themselves and their families out of trouble."